Railroad travel was at its peak in the 1950s. 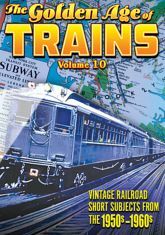 People were encouraged to take cross-country trips on the new diesel-powered passenger trains, while steam locomotives were still indispensable when it came to transporting goods and services vital to America's economy. The job of railroad man was a respected calling that came with its own dangers. Take a train ride back in time with these six nostalgic short subjects. MILESTONES OF PROGRESS (1950): The Association of American Railroads sponsored this film to show all of the advances they'd made since the end of World War II -- including luxurious observation and dining cars that would make any modern-day train-goer green with envy. RAILROADS AND NATIONAL DEFENSE (1951): Made during the Korean War, this short emphasizes how invaluable the railway system is to the U.S. Army, showing trains transporting troops and hauling tanks. ESCAPE FROM LIMBO (1953): Produced by the safety department of the Pennsylvania Railroad, this surreal film tells the story of a dead railroad worker enlisted by Satan to create accidents as part of his eternal punishment. Closer to an episode of The Twilight Zone than a railroad safety film, Escape From Limbo must be seen to be believed. Briefly singing in a bar scene is a young Fred Gwynne, years before he became instantly recognizable to audiences for Car 54, Where Are You? (1961-1963) and The Munsters (1964-1966). 3RD AVE. EL (1955): The Third Avenue El was the last elevated train in New York City. Before it closed down forever, avant-garde filmmaker Carson Davidson shot this impressionistic short in its final days of service. An elegy for a New York that is long gone, 3rd Ave. El met with great acclaim upon its release in 1955. It was nominated for Best Short Subject at the 1956 Academy Awards. BEEF RINGS THE BELL (1960): Learn how the railroads are important to the beef industry in this film from the Union Pacific Railroad. Without trains to haul cattle, a vital part of the U.S. economy would be crippled.